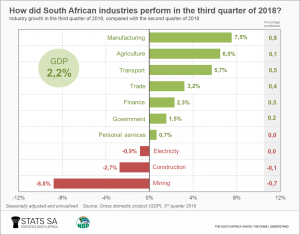 The South African economy grew by 2,2% quarter-on-quarter (seasonally adjusted and annualised) in the third quarter of 2018, bringing to an end the country’s second recession since 1994. 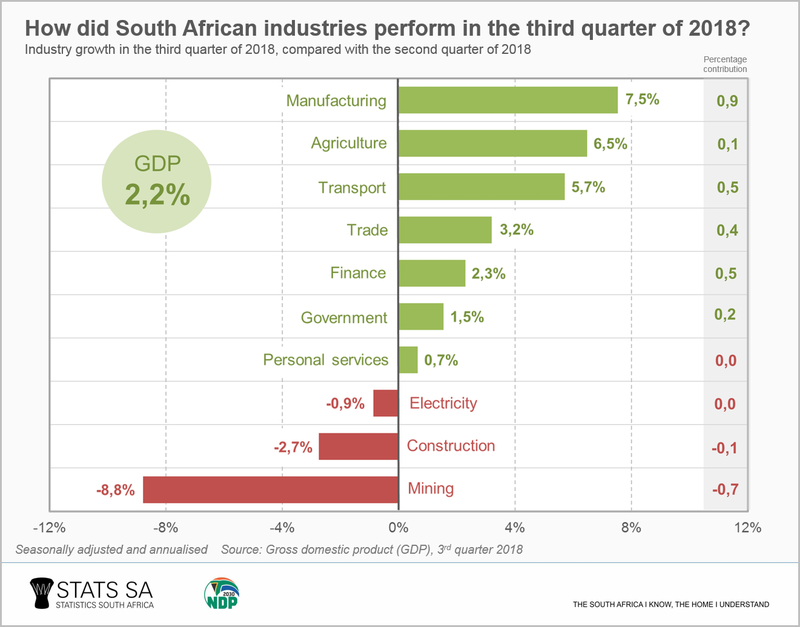 Higher contributions to growth in a number of industries – most notably in manufacturing, transport as well as finance and business services – were enough to lift economic growth back into positive territory. The rise in economic activity in the third quarter follows two consecutive quarters of negative growth, which is a widely recognised indicator of recession. The economy slumped by 2,6% in the first quarter of 2018 and a further 0,4%1 in the second quarter. Manufacturing was the main driver of positive growth in the third quarter. The industry grew by 7,5%2, largely as a result of increased production of basic iron and steel, metal products and machinery; wood and paper; petroleum products; and motor vehicles. This is the largest jump in manufacturing production since the second quarter of 2016. After contracting in the second quarter, the transport, storage and communication industry rebounded by 5,7% in the third quarter, making it the second largest contributor to overall growth. An increase in freight transportation underpinned the rise in activity. This is the largest quarter-on-quarter increase for transport, storage and communication since the third quarter of 2007. The finance, real estate and business services industry was another strong supporter of GDP growth, edging up by 2,3%. It was specifically the activities related to financial intermediation, insurance and real estate which performed better in the third quarter, contributing to the rise. The agriculture industry bounced back from two consecutive quarters of negative growth to record a 6,5% rise in the third quarter. Strong growth in the production of field crops, horticultural cultivation and animal products contributed to the rebound. The mining industry was the biggest detractor from economic growth, declining by 8,8%. Lower production levels were recorded for platinum group metals, iron ore, gold, copper and nickel. Expenditure on GDP increased by 2,3% in the third quarter of 2018. Gross fixed capital formation fell by 5,1% in the third quarter, largely as a result of declining investment in construction works, transport equipment, and non-residential buildings. Households spent more on food, beverages and household furnishings in the third quarter, driving up household final consumption expenditure by 1,6%. Unadjusted real GDP (measured by production) was up by 0,8% in the first nine months of 2018, compared with the first nine months of 2017. For more information, download the latest GDP report and media presentation here. 2 Unless otherwise stated, growth rates are quarter-on-quarter, seasonally adjusted and annualised, and in real (volume) terms.